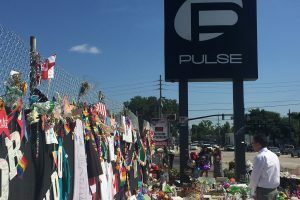 The City of Orlando has entered into a contract to purchase the Pulse nightclub, the site of a June shooting that left 49 dead and dozens more injured, with the intention of establishing a permanent memorial. A city spokesperson confirmed the contract and sale price of $2.25 million. The spokesperson said that the funds will come out of the city’s land acquisition fund, which is used when the city buys or sells land. The city council will vote to approve the land purchase on Nov. 14. City staff will complete a due diligence period in which the land survey, title and environment of the site will be reviewed, according to the spokesperson. The parties have agreed that, following the review period, the contract will be closed on or before Dec. 30. The club, which was a prominent gathering place for members of the LGTBQ and Latino communities of Central Florida, has already become an informal memorial, with visitors coming to lay down flowers and pay respects. The spokesperson said that the property will be maintained by the city just as any other city property and that there is no intention at this time to change the club’s current function as a memorial. The spokesperson, in an email, said that it would be premature to speculate whether the permanent memorial will be free and open to the public or more museum-like. Specifics in terms of how the public comment process will play out are also not known at this time, with details likely coming after the purchase is finalized. “There is not a need to rush this process and we will take the appropriate amount of time to ensure our entire community is involved in the process,” the spokesperson said. The city has been heavily involved in healing efforts following the shooting — including the organization of the OneOrlando Fund, which is in the process of dispersing nearly $30 million to victims and families. Having begun in September, the payout is ongoing, according to the spokesperson, as several family members of deceased victims have not agreed to the distribution plan. The fund’s administrator, Ken Feinberg, is working to mediate these disagreements before sending them to probate, the spokesperson explained.